Ah English choral music. So much of the Western choral tradition comes from the British Isles, so it's no surprise that today, the United Kingdom produces some of the most spectacular choral music on the planet. Whether it's classical, sacred or folk music, the English choirs do it like no one else, and if you have ever sung in a choir, it's a sure bet you've sung arrangements that began with their renowned directors. So why not hear the masters do it themselves? John Rutter was born in London in 1945 and received his first musical training as a chorister at Highgate School. He went on to study music at Clare College, Cambridge, where he wrote his first published compositions and conducted his first recording while still an undergraduate. 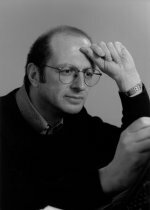 His compositional career has embraced both large and small scale choral works, various orchestra and instrumental pieces, a piano concerto, two children's operas, music for television, and specialist writing for such groups as the Philip Jones Brass Ensemble and the King's Singers. His most recent larger choral works, Requiem (1985) and Magnificat (1990), have been performed many times in Britain, the USA, and a growing number of other countries. From 1975 to 1979 he was Director of Music at Clare College, whose choir he directed in a number of broadcasts and recordings. 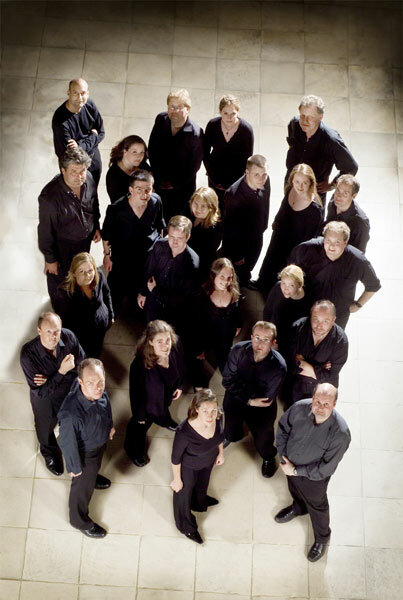 Cantabile have long been acknowledged to be one of Britain's great vocal groups. Their reputation for originality and eclecticism is unsurpassed, and continues to spread ever wider. 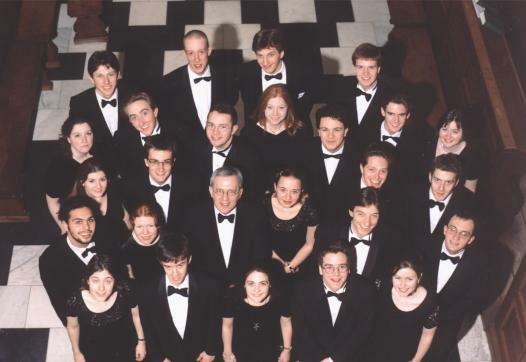 Having been focunded as a purely a cappella student group, Cantabile first came to prominence as the narrators of the Tim Rice musical Blondel , which re-opened the renovated Old Vic Theatre in London before transferring to the West End. Since then, Cantabile have retained their unique and unmistakable sound and inimitable sense of humour. In pursuing a policy of constant and dynamic renewal, Cantabile have won the Ensemble of the Year Award from the Wavendon Allmusic Foundation, for pushing back musical frontiers and exploring ever-new territories. Now a major international act, Cantabile have attracted a substantial following right across the musical spectrum, both in Europe and further afield, and are in high demand for their skills both as performers and as writers in the field of blue-chip corporate and private entertainment. Clare College, founded in 1326, is the second oldest of the colleges of Cambridge University. Situated on the banks of the River Cam in the heart of Cambridge with its main buildings dating from the seventeenth century, Clare is a flourishing community of some 75 fellows, 400 undergraduates, and 130 graduate students. Music plays an important role in the life of the college. In 1971, the hitherto all-male chapel choir was re-establised as a mixed-voice group of some 24 voices, since when it has gained an international reputation as one of the leading choral groups in Britain. The choir is conducted by the Director of Music, who is a Fellow of the college, assisted by two undergraduate organ scholars. 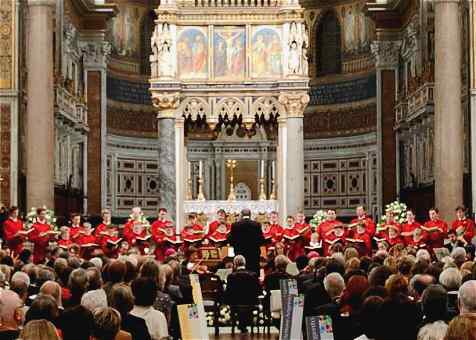 It exists primarily to sing regular choral services in the college chapel, but in addition gives frequent concerts, both in Britain and abroad. Radio and television broadcasts and recordings form a regular part of the choir's increasingly busy schedule. Internationally recognized as the pre-eminent representative of the great British church music tradition, the Choir of King’s College, Cambridge, owes its existence to King Henry VI who, in founding the College in 1441, envisaged the daily singing of services in his magnificent chapel, one of the jewels of Britain’s cultural and architectural heritage. This remains the choir’s raison d’être, and is an important part of the lives of its sixteen choristers, who are educated on generous scholarships at the College School, and the fourteen choral scholars and two organ scholars, who study a variety of subjects in the College itself. Today’s Choir derives its worldwide fame and reputation from the annual broadcast of the Festival of Nine Lessons and Carols, which is heard on radio by millions all over the world and which last year celebrated the 75th anniversary of its first broadcast, together with the now well-established television program, Carols from King’s. It is also famous for its many recordings for EMI and Decca and its international touring program. In recent seasons the Choir has travelled to the USA and Canada, South Africa, Australia and has also made a world tour including concerts in Hong Kong, Macau, Taipei, Tokyo and the USA. Concerts have also recently been given in Bach’s Church in Leipzig, Copenhagen’s European City of Culture celebrations, the Brussels Conservatoire, the Bruges Early Music Festival, Paris’s Musée d’Orsay, in Germany, Greece, and further afield in Barbados and Bermuda. They have just returned from a tour of the Far East and will travel to the US for a tour at the end of this year. Cantamus, a choir consisting of 43 girls aged between 13 and 19 and based in Nottinghamshire, has achieved unprecedented acclaim from critics and adjudicators throughout its career. Formed in 1968 by Pamela Cook, who is still its director, Cantamus has been praised consistently for its amazingly mature style, impeccable technique and unfailing ability to captivate its audiences. The choir has won 16 first prizes in international choral competitions, including the Grand Prix award at the Riva del Garda Festival, Sainsbury's Choir of the Year (twice), Choir of the World at the Llangollen Eisteddfod and Olympic Champions at the World Choir Olympics. It has represented Great Britain in several overseas choral festivals and at the World Symposium in Choral Music. Overseas tours have included Japan, Israel, the USA and Canada, and most countries in Eastern and Western Europe. Founded by Matthew Best in 1973, Corydon Singers are now widely recognised as one of the foremost choirs in Britain. Their first recording, of Bruckner motets, was issued in 1983 and established them on the road to distinction. Their subsequent and numerous recordings, all for Hyperion, have consistently earned the approval of the press in Britain, Europe, the United States, Japan and elsewhere. Their 1990 recording of Vaughan William' s Serenade to Music and other works was selected as Record of the Year by both The Guardian and The Sunday Times, and was nominated for a Brit Award. Their recording of Rachmaninov's Vespers was chosen as the preferred version in BBC Radio 3's 'Building a Library' and their recording of Bruckner's Te Deum and Mass in D minor was selected as one of the top releases of 1993 by the BBC's Record Review. A great many of Corydon's recordings have reached the Gramophone Awards short list in the choral section and they have four times been runner-up: in 1984 with Howells's Requiem, 1990 with Vaughan Williams's Serenade, 1996 Berlioz's L'Enfance du Christ and in 1997 with Beethoven early cantatas. The Finzi Singers were founded by Paul Spicer in 1987 for a Festival of the British Music given under the auspices of the Finzi Trust. 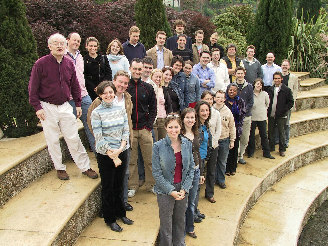 They are now regarded as the major exponent of British twentieth-century choral music in which they specialize. The choir presents original and interesting programmes with a special emphasis on contemporary repertoire. Commissioned works and first performances include music by Michael Berkeley, Judith Bingham, John Joubert, David Matthews, Stephen Pratt, Jeremy Dale-Roberts, John Tavener and James Wishart. Concerts and recordings alike have met with considerable critical acclaim. The National Youth Choir of Great Britain is widely regarded as one of the finest youth choirs in the world, as recent reviews testify. In fact there are now three choirs, the Senior Choir for young people aged from 16 to 22, the Training Choir for students of Secondary School age, and Laudibus, a chamber choir of professional standard. A British Youth Choir existed in the 1970s, directed by David Clover and administered from the city of Sheffield. In 1979 Carl Browning was appointed music adviser to Sheffield as David's successor and took over the British Youth Choir, asking Mike Brewer to be Musical Director. 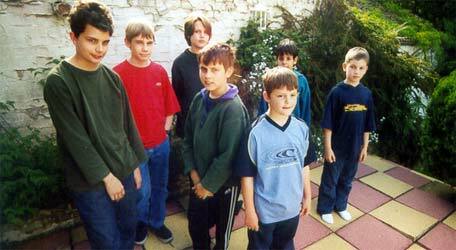 The first BYC course under new management was in 1981. The name was changed to National Youth Choir in '83 to bring the choir in line with our National Youth Orchestra and to change the choir's format to being a highly selected group, representative of all regions of Britain. New College Choir is an outstanding part of musical life in Britain. William of Wykeham - who also rebuilt Windsor Castle for Edward III and founded Winchester College - was responsible for its creation, College and Choir. He provided for sixteen choristers, and clerks. Their duty, to sing the daily office in his magnificent mediaeval chapel. This practice still continues within the context of today’s University life. Both the children and the young adults receive a musical training of the highest standard, in keeping with a world-class university. 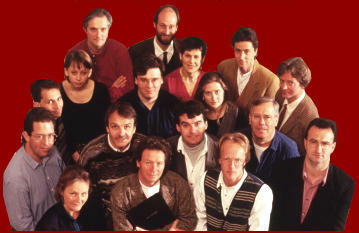 Polyphony was formed by Stephen Layton in 1986 for a concert in King’s College Chapel, Cambridge. After successive concerts there, consisting primarily of early music, the group moved its base to London, and has subsequently expanded its field of activities. For several years the choir provided the music for services in the fine Wren city church of St Stephen’s Walbrook. Polyphony has given concerts in France, Spain, Brazil, Denmark and at festivals all over the UK. They perform regularly in London at St John’s Smith Square. Their performances have received enthusiastic acclaim in the press: the St John Passion was hailed in The Times as a ‘Passion to remember’ and according to The Evening Standard Polyphony’s rendition of Messiah was a ‘vivid injection of the freshest air’.